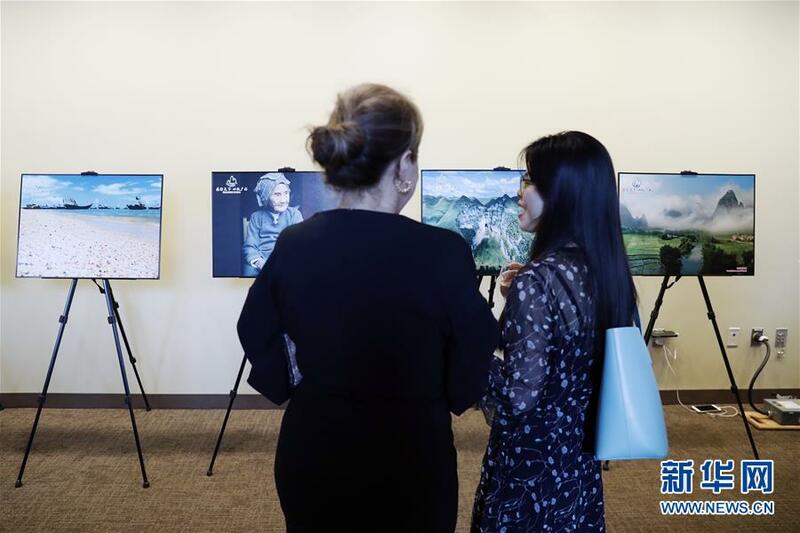 These are just a few of the dozens of pictures exhibited at a recent tourism show featuring the Guangxi Zhuang Autonomous Region of China, held at the United Nations headquarters in New York. "They are so beautiful. I've been to China a few times but mostly stayed in the big cities. I would like to go to Guangxi someday to see these sceneries in person," Caroline Bergonzi, a Monacan artist viewing the show, told Xinhua. Apart from the exhibition of pictures, the promotion show included a video of sceneries and ethnic cultures, a presentation punctuated with rewarded Q&A activities, and an introduction of airlines, attracting some 150 participants from governments, the tourism industry, airline companies and media, from both China and the United States. Li Bin, vice chairman of the government of the Guangxi Zhuang Autonomous Region, said Guangxi hopes to learn New York's experience as a metropolitan city attracting a great number of visitors, and aims to build a series of recreational areas centered around Guilin, Beibu Bay, Bama, and China-Vietnam border features. Deputy Consul General of Consulate General of China in New York Qian Jin said both China and the United States are major tourism countries. Mutual visits by the two peoples have not only enriched the knowledge of each other's food, scenery, culture and history, but also have promoted mutual understanding and trust, Qian said. "Tourism has become a bridge between our two countries," he said. He encouraged the participants to put Guangxi onto their travel plans and pledged on behalf of his office to continue to play an active role in promoting bilateral tourism exchanges and cooperation. New York Mayor Bill de Blasio sent a congratulatory letter to the tourism promotion show, wishing it a great success. Remysell Salas, a representative from the mayor's office in charge of Manhattan community affairs, told Xinhua that he thinks the event is "phenomenal" and "educational," saying he is willing to let his community know what great fun Guangxi will offer. "I am excited. I am willing to buy the ticket to go!" Official figures show that since 2012, China has been the No. 1 outbound tourism expenditure country in the world, and last year over 3 million Chinese citizens visited the United States. Guangxi received 520 million visits last year. Some 5.125 million visits from outside China's mainland stayed at least one night in Guangxi, and 135,000 visits were from the United States. At the same time, the number of Americans visiting China has been growing steadily, averaging about 2.1 million annually. Veteran tourism worker Simone Bassous started her exploration across China almost 40 years ago. In 1980, she went to Guilin. "The first time I went (to China), it was on the Li River. It was fantastic. It was so simple." Over the years, Bassous' list of destinations in China has grown longer to include Mogao Caves and Tibet, but she always thinks "east or west, Guangxi is the best." "It's a dream ... People should not miss it. They should make sure they visit Guangxi," Bassous said.